Overclocked to the max, but does it make this a tempting card? 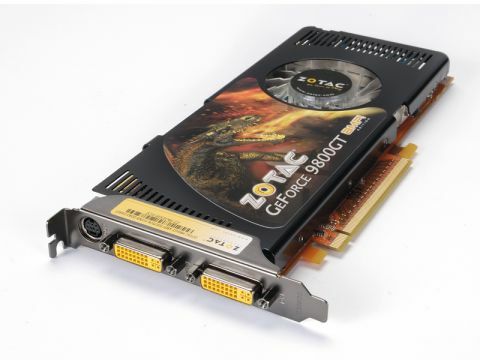 Is this a GeForce 8800 GT by another name? A die shrink of the G92 chip to 55nm aside that'll be an affirmative. All the key hardware features, including 112 stream shaders, 16 ROPs and a 256-bit memory bus are exactly the same. Frankly, NVIDIA has gotten itself muddled with its GeForce 8 and 9 series chipsets. Nevertheless, an effort has been made to give this board a lift. Along with the snazzy orange PCB, Zotac has cranked up the clocks. The core frequencies take a big jump from 600MHz to 700MHz, while the shaders are up by 200MHz to 1,700MHz. That's enough to lift it to 9800 GTX levels of performance most of the time. Hurrah! However, it remains much slower than HIS's similarly overclocked Radeon HD 4850. Haroo. But it's still an attractive board at under £100.